LIONEL MESSI LUIS Suarez and Neymar made merry as Barcelona regained the winning habit in LaLiga with a 5-1 thrashing of Leganes. Luis Enrique’s men suffered a shock 2-1 home loss to Alaves last weekend and made a shaky start at the Estadio Municipal de Butarque. But their attacking stars, who started together for the first time this season in Wednesday’s 7-0 Champions League demolition of Celtic, picked up from where they left off in midweek and combined for a goal apiece to establish a 3-0 lead and end the game as a contest before half-time. 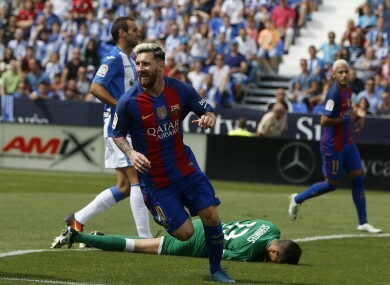 Messi then netted his eighth of the season from the penalty spot and Rafinha added a picturebook fifth as Barca pulled level with Real Madrid at the top of the table ahead of their bitter rivals travelling to Espanyol on Sunday, with Gabriel’s fine late free-kick for the hosts of little consequence. Barcelona’s feted forward trio were rarely involved during the opening stages as Leganes harried a side grappling with their unfamiliar 3-4-3 step-up. The lack of a recognised right-back and holding midfielder Sergio Busquets prompted the tactical switch from Luis Enrique, and the latter’s absence was keenly felt as Andres Iniesta and Ivan Rakitic struggled for control in central areas. Leganes’ ambition did leave their high defensive line exposed and, after Messi had a shot blocked by Diego Rico, he was on hand to slot home in the 15th minute when Suarez crossed having left Unai Bustinza in his wake. Suarez then rampaged down the left, with a last-ditch challenge from Pablo Insua almost resulting in a remarkable own-goal. The frantic nature of the contest remained but now to Leganes’ detriment and they were 2-0 behind when Unai Lopez rolled a pass into Messi’s path for Barca’s talisman to glide past some uncompromising challenges and cut across goalkeeper Jon Serantes for Suarez to enjoy an unguarded net. Darwin Machis looked to find a response, scooting round Javier Mascherano and drawing a sharp stop from Marc-Andre ter Stegen before Samuel Umtiti blocked his follow-up on the line. But, to continue a theme a minute before the break, Leganes’ porous backline was ruthlessly unpicked once more and, following great work from Messi on halfway, Suarez decided it was Neymar’s turn to enjoy a tap-in. There was little the home defence could do to counter a sumptuous pass from Suarez, arrowed through with the outside of his right boot, to put Neymar through on goal in the 54th minute. The hapless Bustinza hauled the Brazil star to ground and Messi whipped the spot-kick high into the right corner. Insua hacked out of his own goalmouth to deny Messi his hat-trick and Paco Alcacer – on for Suarez – had a first Barca goal ruled out for offside after Serantes saved from the Argentine. The final Barcelona goal came from a more unfamiliar source and in glorious fashion as Rafinha strode forward, ushering Messi out of his path, before cutting inside to pick out the top corner left-footed from 20 yards. There was a similarly brilliant consolation finish from Gabriel’s 80th-minute free-kick but the headlines belonged to MSN. After the Celtic match, Neymar said they wished to better a dizzying collective tally of 131 goals from last season. They are on to 17 already, following 10 in a prolific week. What would the Championship’s Player of the Month bring to the Irish team? Email “Celtic weren't the only ones on the receiving end of a hammering from Barcelona this week”. Feedback on “Celtic weren't the only ones on the receiving end of a hammering from Barcelona this week”.